Top 10 TV programs I watched as a kid. Twice a month, on every alternate Friday, we will have a post on ’5ives & TENS’. A top 5 or 10 post on things that I love/like/dislike/hate or simply noticed. Could be anything from food I’ve eaten to cities I’ve travelled. Books I’ve cherished or services I’ve used. This is my personal countdown of life as I have lived. Care to share? Also combining this with the #100HappyDays My personal hashtag is #BlogwatiGSmiles. Yeah, it’s all about ME! 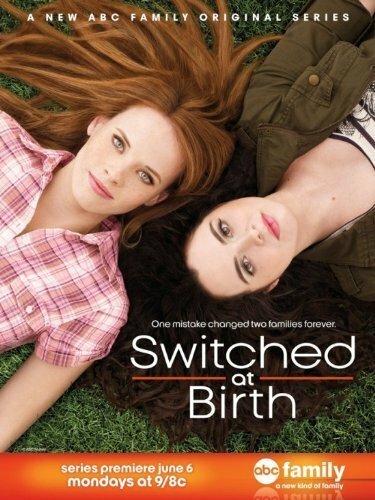 I have been hooked onto this series on Zee Cafe, Switched at Birth. It talks about a tale of two families whose babies get swapped at birth, due to hospital negligence. One of the girls is hearing impaired. So a great deal of the story is in the American Sign language. It has been beautifully interwoven with ‘normal’ people. I chanced upon it while channel surfing and have been following it since then. It features Monday to Friday at 10 pm. It was such a welcome change from the ‘regular’ fare that is dished out, that it got me thinking of my fav TV programs. None in recent times make the cut, so I went digging into my childhood. Yes, I found quite a few. They perhaps lacked technical finesse and elaborate settings, but they had a story to tell. Here are my top 10 in no particular order. Do you remember this gem? Amol Palekar made Bhagyashree a household name with this one. And if you didn’t know it, Ashutosh Gowariker plays her love interest. A take on a middle class home, where three daughters are raised by a single mother. A story told as simply as possible, otherwise known as Little Women. Ah, the good looking Arun Govil as the righteous king, Vikramaditya, who always had to answer the corpse’s trick question. The stories were so wonderfully woven that you’d be glued to the television set. Having read the stories in Chandamama, this was a visual delight. Four brats who moonlighted as detectives when they are not busy being kids. Their adventures were what stories were made of. Catch the young Ali Asgar, now more famously known as Dadi on Comedy nights with Kapil. King Vikramaditya once again, 32 angel statues and their stories. Yes, we looked forward to it every week. Wisdom came in special packaging. Did the king have what it takes? “Giant Robot, make a punch now”. And that is how I remember this cute little chubby boy Johnny Sokko and his robot. The one I hoped to have, one day. There was nothing the robot couldn’t do. He fought horrible looking aliens and won all the battles. Yay, for the wins. “I wish I was a spaceman, the fastest guy alive…………..my heart would be a fireball’. How could you not have seen these series? And Zoonie with the very good looking Steve and the pretty Venus. One of the best shows ever. Sigh! Oh, this was an all time favourite. Fairytales have never been told better. Shelly Duval took us through all time favourite tales with the theatrics of it all. I’d never miss a single episode. Loved them all. I must look for their DVD collection. It is a must have. Spiderman Spiderman, friendly neighbourhood Spiderman………..remember the tune? Sundays 5.15 were reserved for the web guy. Nothing could get us out of the house. He was that amazing, yes. I even painted a series on him as a kid. Animation at its best. The other worthy guy was He Man as he raised his magic sword and fought the evil forces of Skeletor. Why, even his toys were a rage back then. Expensive, but a rage. By the power of Grey Skull, you could not have missed this. Sundays 9.00 am, it was a date. I could not find a You Tube link for this one. However, these series were a boon for my mother who had a tough time getting me to eat anything. I used to watch this program at 11. am everyday before going to school. They had stories and art and craft. And before I knew it, lunch would be done. It was a basic studio show, but then most of DoorDarshan was. Simple, uncomplicated days with not too much info. They let us kids………..be kids. And for that I am grateful. I promise to come back with a top 10 on DD serials too, soon. Yes. all of these 🙂 Also star trek. Ah, Star Trek, yes. But it wasn’t quite my fav so did not make the list. Lol. But it was quite THE thing back then. blogwatig recently posted…Top 10 TV programs I watched as a kid. Among this, Spiderman and He Man were my favorites. They were the real heroes at that time. I remember Dhoop Chaon and Vikram Betal. And Faerie tales. I also loved Yeh joh hai zindagi. Remember that ! Diwakar Narayan recently posted…We are all adjectives! I remember watching Kacchi dhoop, vikram aur betal, He man, Giant Robot, Ek do teen char and of course star trek – was hooked to it !! By God…what an eclectic collection! I grew up on Giant Robot and Spiderman, too!